Christmas breaks allow me to catch up on a lot of reading. The previous months comprising our university’s semester were spent preparing for lectures though I had to do some readings related to researches I am involved in. Browsing the net and social media, I came across 2 articles shared by an acquaintance. He is a very progressive planner who has extensively studied and written about the most relevant issues in urban planning, focusing on transport. A third article I found while reading one of the two. These were very interesting for me in part because they are thought provoking in as far as traffic engineering is concerned. The author seems to call out traffic engineers in general but these articles should also be contextualized properly. The situations mentioned in the articles are to be found in cities in the United States and may not be applicable in other cities in other countries. Traffic engineers in Europe, for example, have been working on exactly the solutions being mentioned in the articles that would make streets inclusive and safe especially for pedestrians and cyclists. The same with Asian cities like Singapore and Tokyo. In the Philippines, however, there is so much that we can learn from the articles. The mere mention of the design guidelines being used in the US betrays the flaws of highway and traffic engineering in the Philippines. The Philippines’ highway planning manual and other guidelines used by the Department of Public Works and Highways (DPWH) are heavily drawn from US references. Most highway and traffic engineers in the country are educated using curricula that use US textbooks and references. There are even civil engineering programs that use licensure exam review materials as their references! These exam materials are also known to be based on DPWH guidelines and manuals aside from problems “outsourced” or patterned after the Professional Engineer (PE) exams in the US. Few schools have progressive curricula that look to best practices that take into account the complexities of roads especially in the urban setting. Such ‘copying’ of American standards and practices in many cases do not consider Philippine (local) conditions and blind applications to our roads instead of proper adaptation often have lead to unsafe and inequitable roads. It’s been more than a decade since the MMDA implemented what was formally called the Grand Rotunda Scheme. To most, it will always be the U-turn scheme that was implemented all around Metro Manila. After seeing what seemed like success along roads like Commonwealth and Quezon Avenue, it was concluded that the U-turns were the answer to Metro Manila’s traffic woes or at least the part that’s blamed on signalized intersections. The perception by many at the time was that traffic signals were not working and caused so much congestion as evidenced by the long queues at intersections. This is not entirely false as intersections with in-optimal settings would definitely bring about congestion especially along corridors or networks where signals are not coordinated. It was, however, a generalization at a large scale and led to more experiments of opening and closing slots in order to determine which would be the most effective combinations. These experiments and their outcomes include drivers becoming more aggressive in order to maneuver ahead of others at the U-turn slots. Weaving has become the norm and in many cases have increased the risk of road crashes. Traffic signals have been installed and the section of the median island has been removed across Ateneo’s Gate 3. This will become a three-leg intersections once again but I hope the signals will not favor Ateneo over through traffic along C5. Traffic lights are already installed along the southbound side of Katipunan at the approach to the junction with Miriam College’s Main Gate. This will be a four-leg intersection as across Miriam is B. Gonzales Street that connects to Esteban Abada. The signals are supposed to be operational starting September 13, which is a Saturday. Perhaps this is to try it out first during that weekend and for the MMDA to do some tweaks before the real deal that is traffic on Monday. But then how can you simulate traffic generated by the two schools in the area except maybe if there is significant enough traffic on Saturday? Did the MMDA or its consultants do some simulation using their computers and the VISSIM software they acquired many years ago? Or will we see more of the experiments as signals are fine-tuned according to the conditions along Katipunan? 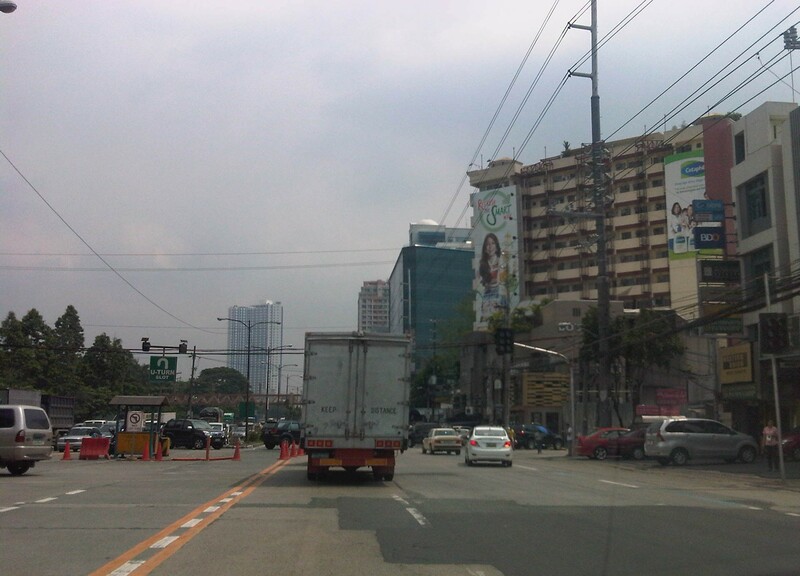 We are hopeful that the signals along Katipunan will help improve the traffic along this very busy corridor. The results for sections of C5 from Libis (QC) to Ugong (Pasig) are promising and many people I know have told me that traffic has improved. Of course, this may also be partly due to the one-lane policy the MMDA has implemented for trucks. It’s never just one scheme or measure that will work wonders for Metro Manila traffic. It will always be a combination that will alleviate traffic woes in the metropolis. We’ll soon know what will become of traffic along Katipunan. We should, however, temper expectations at least for the 6:30 – 7:30 AM period during weekdays when traffic peaks in the vicinity of Ateneo and Miriam. The sheer volume of vehicles generated by the schools will overwhelm any system that is put up in the area. Nevertheless, for the rest of the day at least traffic flow should improve when signals are operational once again for Katipunan. Among the things you get to observe at signalized intersections are the behavior of drivers given the setting of the traffic lights. While the cyclic transition from red to green to amber and then to red again seems routine and possibly trivial to many, it is an opportunity for traffic engineers to examine how drivers react to the lights. Among the most notable behavior are common violations like beating the red light and occupying the area within the yellow box despite full awareness that the exit is already full. Then there are the not so obvious but risky habit of some drivers to beat the green light. That’s when a driver anticipates the green light and proceeds to move prior to the signal and before the intersection is clear of any vehicles or pedestrians that may have been caught in the change in signals. It is a practice that increases the probability of a road crash occurring as the clearance interval for vehicles whose paths may be in conflict is drastically reduced. This is a habit of many drivers who are familiar with the sequence of signals at an intersection and who know when its their turn for the green light. In most cases, drivers and pedestrians are unaware of the length of time available for them to cross the street or intersection. There are no indications for when the lights will change and only familiarity would allow for drivers or pedestrians to estimate when it would be their turn to proceed. In Japan, many intersections play music during that tends to speed up when the signal will be changing. This audible indicator allows for both the blind and the busy to know whether it is safe to cross the street and if there is enough time to do so. It is also something that is probably taught to children for them to more easily know when it is safe for them to cross the street. There is another innovation to traffic signals that is surely welcome to pedestrians and motorists alike but which may also have its disadvantages. I am referring to the countdown timer, which provides road users the information about the lengths of green and red signals (Note: Amber or yellow is usually fixed at 3 seconds.). From the perspective of energy efficiency, such information may allow motorists to turn off their engines, usually done when one practices eco-driving, resulting in fuel savings. Meanwhile, drivers of vehicles approaching an intersection may be able to tell if there is enough time for them to do so, and if there isn’t enough time they may be able to slow down their vehicles to stop at the next red light. Countdown timers may also be a helpful tool for enforcement as the timers establish that a driver should be aware of the time. Thus, a driver can no longer reason with the apprehending officer that he/she was not aware of the remaining time for movement. Pedestrians may also benefit from the knowledge of available time to make a safe crossing. This information should ultimately reduce the need for running in order to completely cross the street. 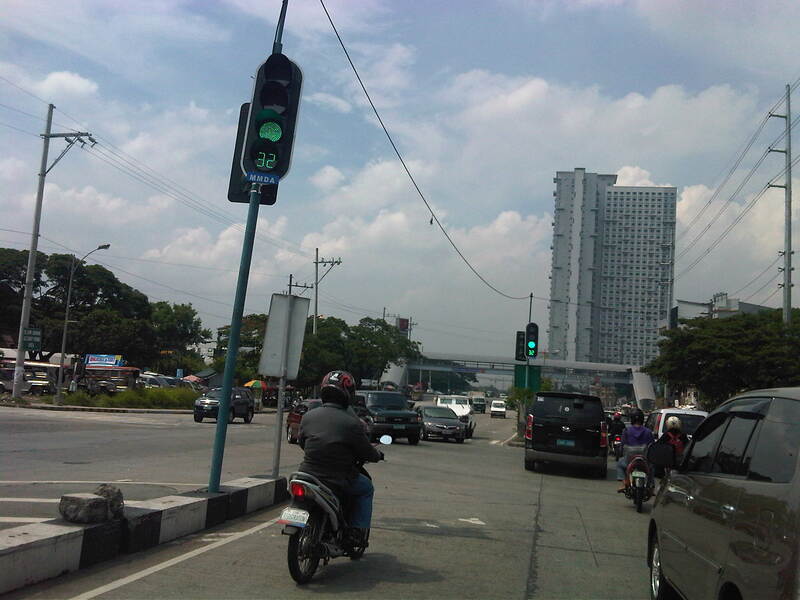 The photo below shows the new countdown timer installed for the southbound through movement at the Katipunan Avenue (C5) – C.P. Garcia Avenue intersection. One possible disadvantage would be that aggressive drivers may still try to beat the red light by speeding up upon knowing what amount of time is available for them. Another disadvantage relates to beating the green light as even those unfamiliar with the signal sequence will have the information of how much time remains before they can proceed. Thus, many driver and riders start revving up their engines and push on their gears to anticipate the green signal. You can even imagine the countdown timer being used as if it were ticking towards to start of a race. Despite the disadvantages mentioned, countdown timers should prove to be more beneficial than detrimental in most situations. In fact, countdown timers like the ones already installed at intersections in Bonifacio Global City should enhance traffic safety provided that these devices are fully complemented by enforcers who would flag down motorists and pedestrians who would attempt risky actions in relation to the timing device. Of course, from the research perspective there needs to be a scientific assessment of the actual impacts of countdown timers much like the studies already conducted elsewhere to determine and even measure the effects of these devices on both motorists and pedestrians. Only then can we truly say if they do enhance safety and promote more efficient operations at a signalized intersection. Metro Manila and other cities around the country are again in the headlines because of flooding brought about by strong rains. Rains are not new to the Philippines and there are many articles (and blogs) that have been written about the history of flooding in the Philippines. Some even feature old photos or caricatures showing how life was during the Spanish and American periods when floods also occurred, probably due to similar strong rains brought about by the monsoons or by the typical typhoons that regularly visit the country during the wet season. In those times many years ago, the subject of drainage has already been mentioned and there is evidence that certain infrastructure were constructed to address the problems of flooding. In fact, the esteros that we presently associate with informal settlers and garbage were man-made waterways that functioned as open channels that could alleviate flooding in times of heavy rains. These waterways also functioned as transport facilities as they were constructed wide enough for boats to travel along the network of esteros that also connected with the Pasig River. These were not so different as the waterways that are now being used in Bangkok that have significant commuter and even goods traffic. There are many photos of these esteros as they were back in the Spanish and American periods. There are even more recent postwar photos that allow for comparison with photos at present. Unfortunately, I cannot post these here as there may be IP issues involved. Nevertheless, one can use your preferred search engines to find and view these photos. Through the years, however, these esteros have been neglected and, as more and more squatters came to construct their shanties above the channels and tons of garbage disposed of, they became clogged and thus resulting to flooding in many parts of Manila. The esteros, however, are not wholly to blame when the subject of floods come up every now and again. It is a fact that the drainage systems of Metro Manila and other Philippine cities are already quite antiquated and their designs cannot accommodate the amounts of rainfall experienced these days. This is the result perhaps of poor planning and even more due to the neglect of national and local governments. And so we now experience floods almost each time we have significant rainfall. In some areas, the floods do not recede until after the wet season is over. Such is the sad plight of many Filipinos who are reduced to prayers and tests of faith if only to assure themselves that things will improve – some day. Meanwhile, other cities have engaged similar flooding problems head-on and have invested on solutions that have saved their cities from much of the costs due to damages brought about by floods. Among those cities is Kuala Lumpur in Malaysia where they constructed a tunnel that is usable as part of their drainage system as well as a highway. Kuala Lumpur’s SMART Motorway Tunnel is an example of an engineering solution that could help alleviate flooding in Metro Manila. It is quite costly, with construction amounting to about USD 514.6 million at the time of its completion in the first quarter of 2007 with construction starting about 4 years earlier in 2003. Much has been written about this infrastructure and its benefits. It has saved KL and Malaysia from potentially disastrous flooding so many times now since its opening. Was it worth it? No doubt our Malaysian friends with tell us it is and will continue to save them from more floods years from now. Thus, the cost of such projects can easily be justified and the return in investment will be quite quick given the costs of flooding that have been compiling these past years including 2009’s Ondoy (Ketsana). In fact, KL’s SMART Motorway Tunnel is part of its tollway system and was built using a public-private partnership (PPP) arrangement that is much like what the current administration is preaching. Perhaps its not yet too late for Metro Manila and other Philippine cities? Maybe we should get our acts together in finding and contributing to solutions that also address multiple problems facing our cities in this era of climate change and extreme weather conditions.